I started my 4th Chain of Command campaign yesterday: Operation Martlet. This is the second campaign I have played with Mike P, we usually get to play every one to two months although there have been longer gaps. We met at the Hobby Bunker in Malden, MA. Martlet started on June 25, 1944 and was part of the British plan to protect the right flank of the main allied attack in Operation Epsom. In our campaign we follow the part of the operation that is an attempt to take Fontenay-Le-Pesnel first; the initial attack is to be carried out by a platoon from the 11th Royal Scots Fusiliers, and then a platoon from the 7th Duke of Wellington's is to carry on south to take Rauray. Defending are the 12th SS Panzerdivision: Hitler Jugend. I am taking the side of the British and Mike the Germans. Historically the attack failed and unfortunately yesterday my initial attempt also failed. 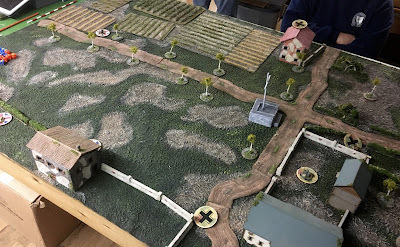 We actually played 3 campaign turns and Fontenay-Le-Pesnel is still in German hands. Here is the terrain map from the campaign. 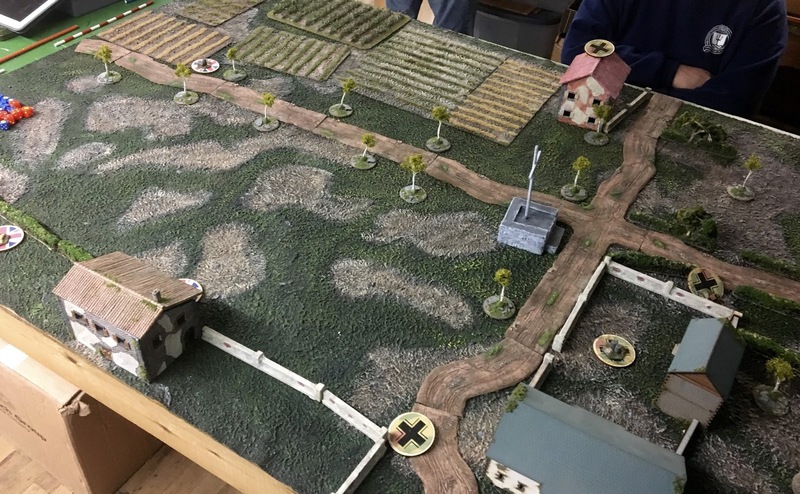 There are some nuances to this campaign, the Germans are under a constant artillery barrage so have to dice to see if there units will arrive on the table and on the 5 game turns of day 1, this is with a -1 modifier. So essentially the Germans had to get a 5 or 6 in the first turn of each game we played. The British equally are handicapped by a heavy morning mist, having to get a 4, 5 or 6 for each unit they try to bring on in the game turns 1 and 2. Each unit caught in the mist has a second chance to get out, however if they fail a second time they are lost for good in that game turn. This is scenario 2 from the main rulebook. So the game started, my first roll of the dice was for the number of free Patrol Marker moves I was to get, this was a grim harbinger of things to come....... I got a 1! Here is where the JOP points ended up, quite unsatisfactory for the British. The tricky bit though was that these were the JOP's were fixed for the next 2 campaign turns if I failed to get off table one. We both diced and got 8 on Force Morale. This game was a brief affair lasting less then 30 minutes. 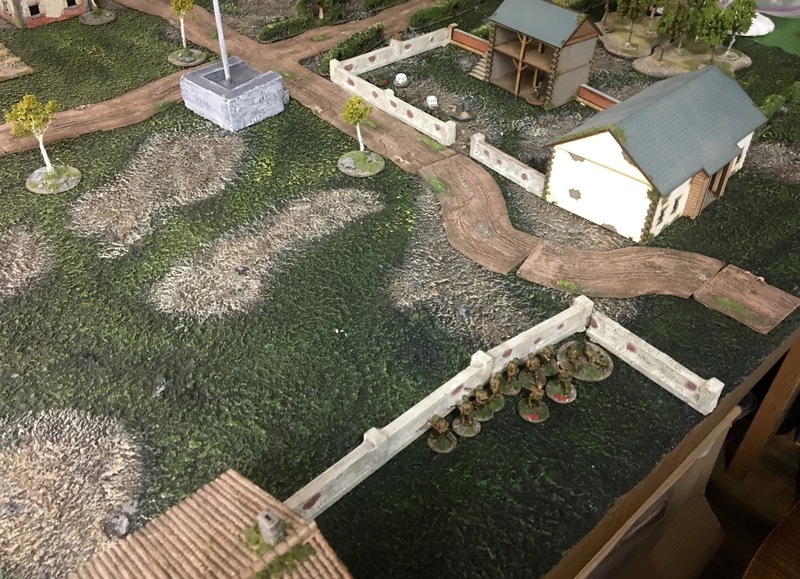 Although the Germans had some difficulty getting on table because of the Artillery Barrage, the British were completely stymied by the mist with 75% of the units being lost or permanently lost. I believe all I got on was a 2" Mortar team. I decided to withdraw, a quick German victory. My dice rolls in this game were a harbinger of things to come for the whole day. I believe we again both diced 8 on Force Morale. 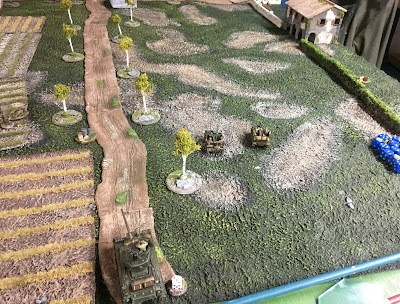 Again a brief game, although I got a few more units on the terrain, but the mist still caused loss. Dicing was quite poor and while Mike was quite successful in getting his troops on the table. I lost my 2" Mortar team pretty quickly as well a my Sherman. 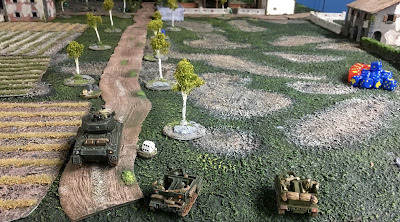 By the time Mike had more than half his units on the table and his Panzer IV hull down at the crossroads, I figured out it was futile. I had hardly any units on the table and Mike had control of the terrain. So in order to preserve my troops I withdrew a second time. We had lunch. Mike got 11 and I got 8 on Force Morale, another great start! By this time, I had figured out my tactics were not working, I really had to get the troops on the table and attack in multiple directions. At least the mist had lifted. I was still troubled my poor dice and Mike's multiple double phases. I got 2 double phases, one with 4x6's, with a 5 followed immediately by a 3x6's with a 5 and a 1. This was followed by a 5,2,2,1,1; just unbelievable. I will let the photos tell the rest of the story. The JOP's for all 3 games. Getting ready to take a run for it. The fence is a major obstacle so requires a phase to cross. A Sherman and two jeeps ( I had to substitute some UC's). 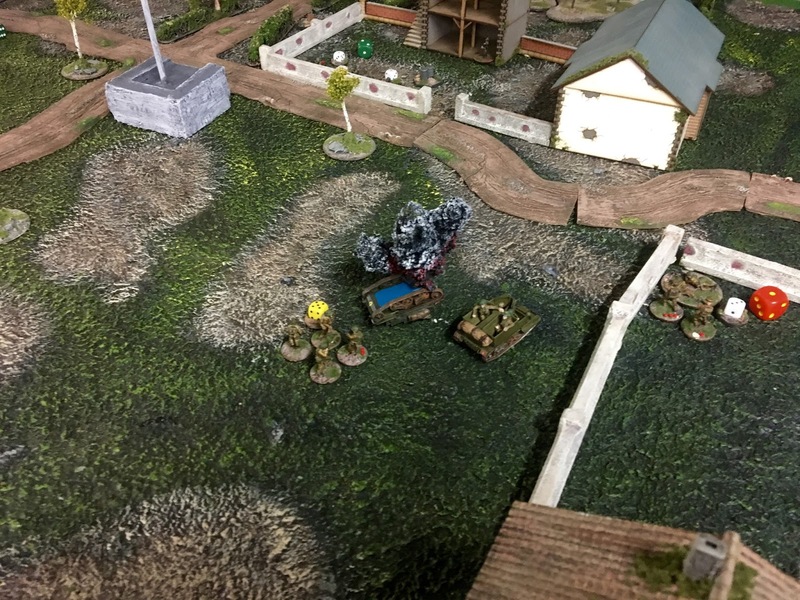 The Sherman immediately took a hit from the Panzer IV at the other end of the table. I forgot that wheeled vehicles get an immediate move much to my detriment. Very slow indeed. The section in the field to the left deployed and then never got activated for the rest of the game. I also got a section in the second floor of the house to the right, they were able to lay down some covering fire but not enough. Mike has a squad in the barn, to stop the Brits when they make a run for it. He also has a PG squad in the house to the left as well as the one behind the fence in the centre. 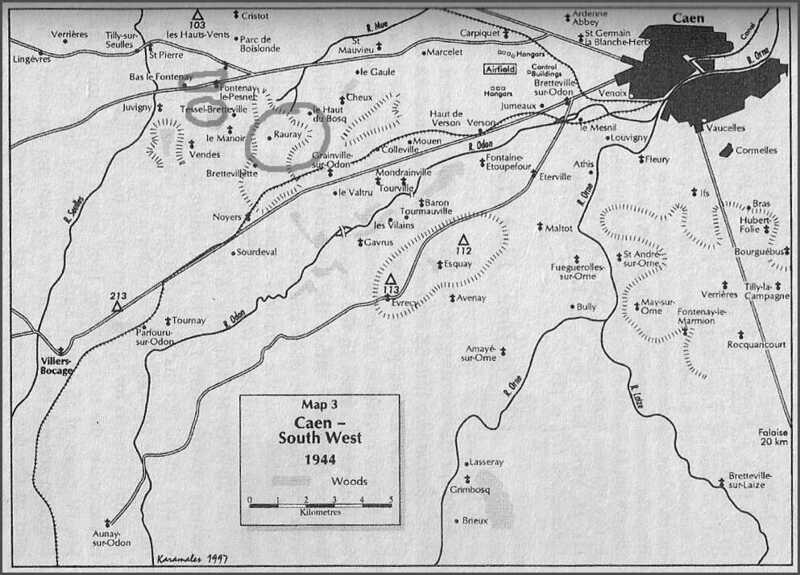 Quite impregnable all in hard cover all firing 20+d6 each time they were activated which was frequently. Getting a little closer but as you can see the unit behind the fence is done for with just a SL, wounded JL and Bren Gunner left. Up goes one jeep, by now the attrition was adding up, I got the second jeep just across the road but the jeep was blown up my the PG squad in the barn. By then my morale was down to 4, time to withdraw, with a loss of 16 men and a dead JL. Well that was it, a tough outing, I am not in good shape for this campaign as you can see by the tracker below, but I was taught to soldier on, hopefully our next game in 2 weeks. So it goes I suppose! How come you withdrew in the last game? If the jeep was across the road, wasn't it home free? I wouldn't bother taking any tanks for this scenario. 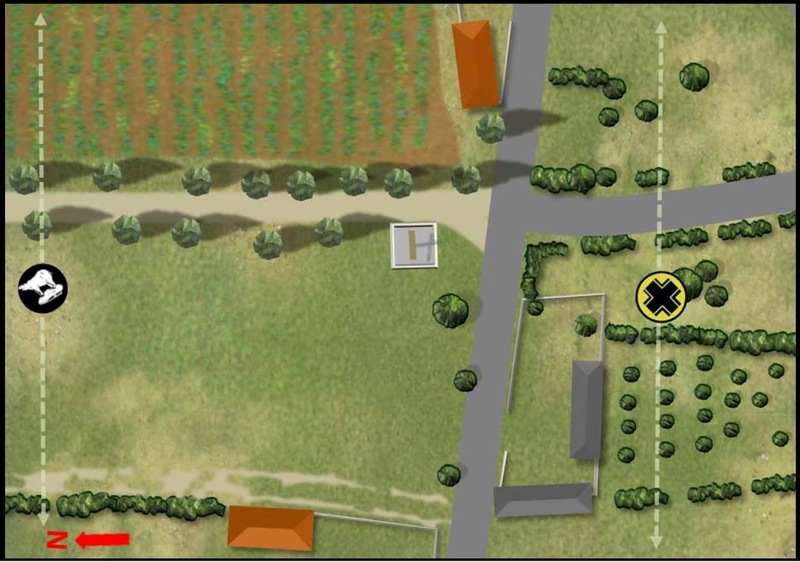 The Panzer IV in a hull down position will just outshoot them. 3" mortars might be more useful. 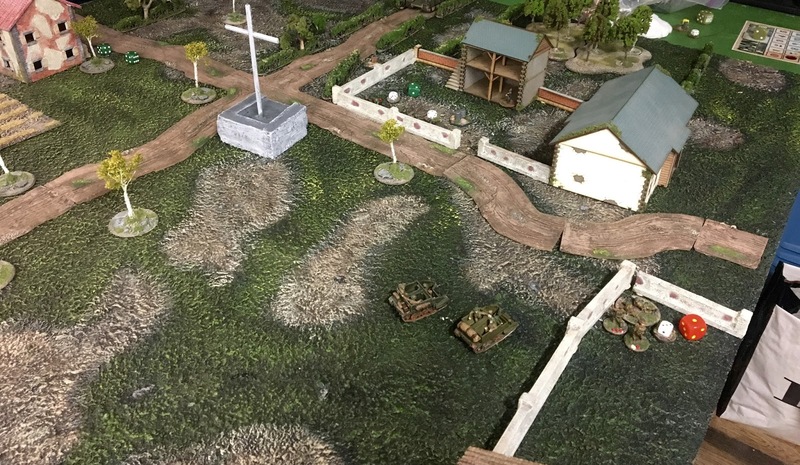 One point though; your campaign tracker lists the Germans as having 10-man squads, and your report states they put out 20d6 per phase. You know the German squads in Martlet are only seven men, right? Two 3-man gun groups and a JL, so their firepower is 16 dice. The whole German platoon is only 22 men, it's their Achilles heel in this campaign. It doesn't take a lot of casualties to reduce them to an ineffective level. Good luck with your next crack at it though! Thanks Andy, I missed completely that the PG squads have no rifles and are effectively only 2 LMG's. I did not get the jeep across the baseline (which I believe to be the end of the table, not there 12" forward line). I realize now that I was really handicapped in these game. Reading your report brought back good memories for me playing this campaign. I played the Germans and a hull down AFV along with the FOO worked wonders against the Brits. I am routing for you John and look forward to seeing what you do next game. or should that be rooting for you? As in cheering....you know what I mean. Thanks Pat, I remain positive! These are great reports! Definitely inspiring me to do Operation Martlet first instead of Scottish Corridor when my figures come. The spreadsheet you've put together is a great idea! I may have to do something similar.